Rebecca is a Textile Designer and Hand-weaver. She graduated from Bath School of Art & Design with a BA in Textile Design for Fashion & Interiors, specialising in weave. She has been a Licentiate Member of The Society of Designer Craftsmen since 2015. Working from her studio near Cirencester, she creates designs for woven cloth using extensive sampling by hand on her old wooden looms. Designs are developed for commercial clients for production weaving by artisan woollen mills, for one-off commissions or for exhibition. Bold patterns created in un-dyed British Wool in black, greys and browns as well as ‘sheep colour’, accented with colour from natural dyes are her signature designs. 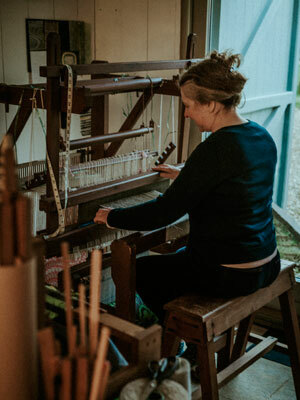 Rebecca demonstrates and teaches weaving and natural dyeing at her studio and for many organisations across the South West, including Bath Spa University and Cotswold AONB. She has represented British Wool, weaving on their stand at Decorex International and taught a Back-strap Weaving Workshop at their Wool Week ‘pop-up’ showcase in Baker Street, London. “I get such satisfaction from introducing weaving to beginners and facilitating their explorations as they create cloth, art or something crazy!"